We've helped leading green companies like Seventh Generation, Honest Tea, and Clif Bar take off in the marketplace. We connect people to entrepreneurs building sustainable enterprises from the ground up and Main Street businesses that serve their communities. 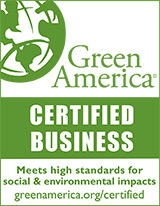 We certify green businesses with rigorous Green Business Standards in over forty industries. All companies seeking Green America's Green Business Certification must meet Green America's standards for all businesses, and also meet or exceed all required standards in their industry. 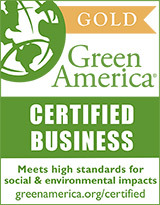 Businesses earn this seal after staff at Green America's Green Business Network reviews and approves their application. Businesses earn this seal after completing additional work beyond general certification. Their application has been reviewed and approved by the Standards and Certification Committee, appointed by Green America's Board of Directors. Our Green Business Certification not only helps you find green products and services, but it also helps green businesses implement ongoing sustainability work smartly and strategically using our online platform. We provide the tools to help businesses turn their social and environmental mission into action. Green America's Green Business Standards have been evolving since the 1980s. In 2014, they were revised with input from Certified Green Businesses, allied organizations and certifying agencies, and government and academic institutions. Businesses that have attained the Gold Certified Business Seal have successfully completed an evaluation by the Green America Standards Committee. The Green America Standards Committee conducts reviews using data provided by the business and independent sources to certify that a business has moved beyond general sustainability actions into a deeper focus on their core business area. Operating since 1982, the Standards Committee is appointed by and reports to Green America's Board of Directors. We redesigned the Green America Seal in 2016 for Green America's Green Business Certification with a fresh new look that profiles the social and environmental attributes of our green businesses to consumers. Our new design reflects the goals of the FTC Green Guides, aimed at ensuring that environmental claims made by businesses are legitimate and green. Green America’s Green Business Certification helps businesses go green every day to build an economy that works for people and the planet.